HI everyone, I don’t know if you can help me with this. 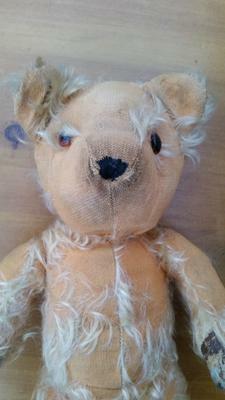 “Bear” was my mothers bear and I am trying to find out how old she is. My Mother was born in 1946, sadly I lost her in 1999 so I cant ask for more information. 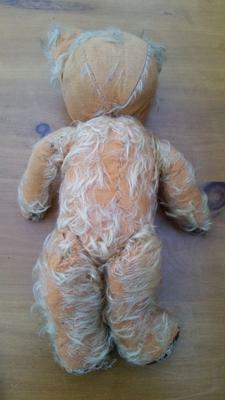 I have always presumed Bear was the same age as my mother, but I discovered the other day that what I thought was sawdust stuffing is actually called Wood wool and from what I have read this was used up till 1914, so she might actually be older than first thought, or I might have got this information wrong. I don’t know if bear was bought new for my mum, or passed on herself. 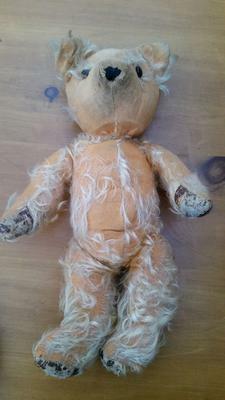 Poor Bear is not in the best condition. She has a growler – again I only discovered this the other day, but it does not work, but it feels like a around disc on her belly, which you can press. There feels to be a spring underneath as it pushes back into position afterwards, but no sound. I don’t know if this helps with the aging of the bear though. She has what I think are glass eyes, one is partly broken, but they are brown on the outside with a black pupil. Is there anything else about these which might help with aging? 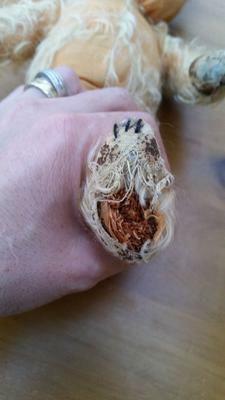 There is very little fur left – as you can see from the pictures, I think the fur which is there is perhaps Mohair, its very fine and Im scared to touch her for fear of losing more. She was obviously originally quite fluffy and the material which is now showing is quite “orange” in colour and quite course – see the close up picture of her nose. The nose is just black stitched, I don’t know if this is original. Her pads are darker, almost look like leather you can see from the close up of the foot at the coating (whatever it is) is sort of flaking off, so I don’t think it is leather, but its coated fabric of some sort. Her legs and arms move, they are jointed with what feels like cardboard discs, so you can put her in a sitting on standing position. These all still work ok.
She has no labels or anything that I can find, I have attached pictures which may help and would appreciate any help with her aging her if possible. It would be lovely to find out if she was manufactured by anyone in particular but I suspect this is a big ask. Im in the process of getting some prices to restore her, at least replace her pads and giving her a clean, it would be lovely to get her looking more loved.